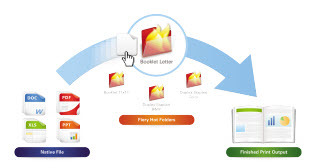 Fiery® Hot Folders provide a drag-and-drop operation that can be shared with other users on the network and Virtual Printers work in environments using print drivers for printing. Do more work by automating repetitive tasks. Fiery® Hot Folders let you do more work by automating the job-submission process. They also reduce errors and automate repetitive tasks with a simple drag-and-drop operation. Publish and share Fiery Hot Folders with multiple users in your network for faster, error-free printing for everyone. Download the latest version of Fiery Hot Folders when you download Fiery Command WorkStation®. Fiery Hot Folders is only enabled when it is connected to a Fiery server that includes Hot Folder support. Fiery Hot Folders and Virtual Printers are standard features in Fiery external servers and some Fiery embedded servers. Visit your Fiery Driven engine's web page to find out if your Fiery server includes Fiery Hot Folders and Virtual Printers. * Requires Microsoft Office to be installed on the same computer with Fiery Hot Folders.